To get a job done well, it always helps to have the right tools. Even better, is to have great tools. Like parents across the Pacific Northwest, I am getting ready to send the kiddos back to school, which means lots of prep. If you think that means shopping for school supplies, that boat sailed in July. I’ve had stacks of notebooks, pencils, and crayons since they hit the shelves last month. No, I’m talking about the next step of preparation: packing lunches. Like most novel projects, many parents start with the best of Pinterest intentions, but then the reality of paperwork, homework, activities, lessons, and short days hits. Something has to give, and lunch is often it. To that end, I embarked on a project to find a readily available bento box, worthy of recommendation to my readers and clients. Why a bento box? There are lots of reasons. Let’s start with the fact that they are compartmentalized and there is something about keeping food separated that is vastly appealing to kids. Frankly, it’s vastly appealing to many adults, for whom I am really creating this post. I have had several people ask me for lunch help this week, including teachers who are also moms. Listen, school stress is more than doubled when you are a teacher AND a parent, so teacher-parents, I really put this together for you. But, I digress . . . . 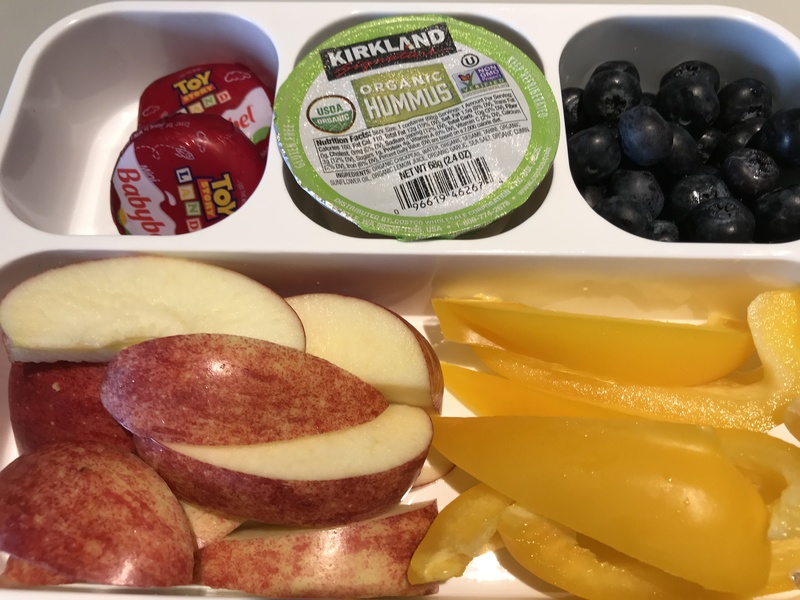 Since the goal is to work in as many healthy lunches as we can over the course of the week for our kids and for ourselves, a bento box is an outstanding tool. I already mentioned the appeal of compartmentalization, and we really should not underestimate the importance of presentation. They offer pre-done portioning. The bento box I am recommending offers half-cup wells, ideally suited for fruits, vegetables, and pastas. Having a set number of compartments to fill nudges us to add variety. A big bento bonus is that they encourage mindfulness. Choosing the foods to include in your bento, deciding what colors play best off each other, and pairing foods that not only enhance the nutritional profile of your lunch, but the taste sensations, is the true beginning of mindfulness. Enjoying your thoughtfully chosen and arranged lunch hours after putting it together is a gift you have given yourself. My experiment began by ordering several bento boxes from Amazon. I chose Amazon because they are a Pacific Northwest-based rockstar that makes products available to anyone, anywhere. Originally, I thought I would do a standard product review, but in light of the requests I’ve had from teachers for lunch help, I am counting this as a mommy-helper day and keeping it simple by only mentioning my top choice. I am in no way connected to the company that manufactures the bentos, nor am I being compensated in any way for sharing my opinions of their products. End disclaimer. The winning box was the Kinsho Bento Box. I tested the Bento Lunchbox Containers for Kids, Adults. 6 Compartment. Lunch Box. Leakproof School Bentobox or Meal Planning Portion Container. BPA-Free Dishwasher & Microwave Safe. Boxes hold over 4 Cups. Blue. Truth in advertising is always a plus and this baby really is leakproof. I filled it with water and treated it like a snow globe. Not only did the water not come out of the box, each compartment retained it’s own water; there was no leakage between the food wells. This is a big deal if you have lovely cucumber soup neighboring toast rounds. No one wants soggy toast rounds come noon. Another plus is that mine did a good job keeping cold food cold during its 6 hour stay on the kitchen counter without a freezer pack. To ensure your cold food (especially animal proteins) stay in the safe zone of less than 41 degrees, keep yours in an insulated bag with a cold pack, or place it in a refrigerator. The are lightweight, microwave, and dishwasher safe. I ran mine through the dishwasher, but I limit any food warming or warm food storage to stainless steel or glass, so I didn’t bother to run it through any microwave or hot food trials. I packed it with a lunch that was intended for my daughter to take to a rehearsal tomorrow. It didn’t survive until dinner time. Bento Box Basics where I will give you ideas to fill your bento and your belly.